I have just re-read this whole thread - documenting Hoi's kafkian odyssey in attempting to get some official data from the FAA and NARA of the four alleged hijacked airplanes. It cannot be more obvious that those flights simply never existed - and that the US bureaucracy simply cannot supply any proof to the contrary. 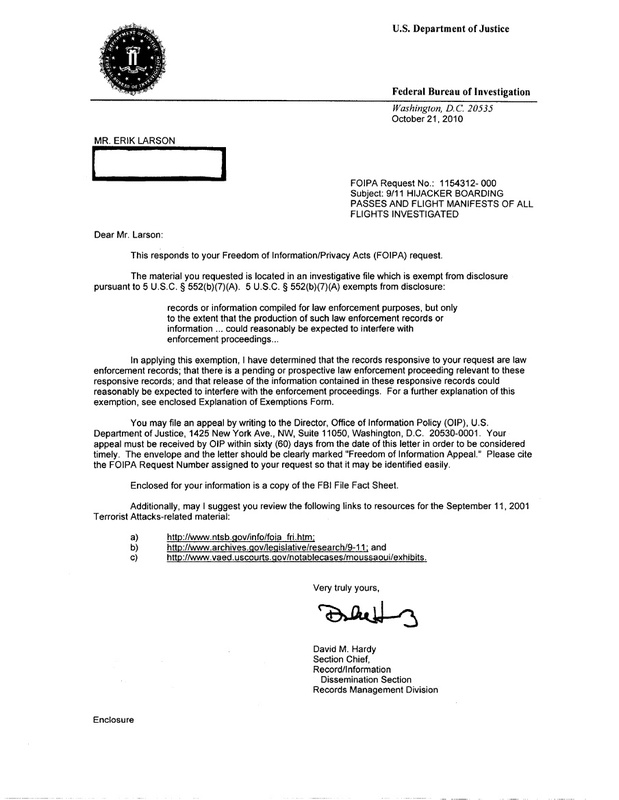 FBI denial of FOIA request for all 9/11 hijacker boarding passes, and all manifests for flights investigated in connection w/ 9/11. Reason cited; "... could reasonably be expected to interfere with law enforcement proceedings." So, If anyone asks you if the 9/11 flights' manifests have ever been officially released (no, not those worthless passenger lists published by the media) the clear and plain answer is: NO. Simon, I want to clarify for you - and update everyone on - the subject of my quest for answers. I am requesting a fee waiver because of my inability to pay more than $50 and because of the potentially dire implications of these findings - i.e. ; traitors within high levels of our government. Thank you for a timely response. This research has already been delayed a full year because of the time it took for Mr. Paynter's initial response to my request (sent in October 2009). Although it should not be necessary, I hope you will note this is not a political FOIA request; it is a patriotic use of our rights to try to keep democracy alive in our country against those who resent freedom. In order to determine my status to assess fees, you should know that my fee category is: an individual seeking records for personal use and not for profit. The maximum dollar amount I am willing to pay for this request is $50. Please notify me if the fees will exceed $25.00 or the maximum dollar amount I entered. 1. This document may reveal complicity of traitorous factions within our government who allowed the crime of 9/11 to take place and protected its operants. 3. This document will help the American people understand who was responsible for the 9/11 terror event. 4. The American people may be able, with cooperation of loyal American government persons, to oust the traitors and try them for war crimes against Americans. 5. I have no explanation of how this information could be commercially exploited. As an important element of the public record, it may appear in books or newspapers or magazines. However, the nature of the information may be so controversial that no commercial interest will print it. Therefore, it is nigh guaranteed that commercial interests are at the lowest level possible. 6. I have no further explanation as to how this information could be commercially exploited. I have no commercial interest in this information whatsoever, and I think the American people will benefit in social and political understanding strictly. I request expedited processing of the request and provide a justification below. I believe a compelling need exists to warrant expedited processing because there is an imminent threat to the life or physical safety of an individual. Please see above explanations and the reason for expedition should be urgently clear. This is an informal response to your November 24, 2010, Freedom of Information Act (FOIA) request (our case number NW 35023) for access to specific Federal Aviation Administration (FAA) files relating to the events of September 11, 2001. We have located the requested textual documents. These documents have been digitized electronically as PDF files, so we also have the capability to provide them to you on a CD/DVD. One CD/DVD (containing all of the documents) will cost $15, while the textual documents will cost $.75 (seventy-five cents) per page. The cost of the textual documents will be at least $300. Please let me know which format you prefer, and I will prepare a formal response and price quote for you. If you have any questions, please contact me by email at marykay.schmidt@nara.gov or by telephone at 301-837-0596. Thank you for taking on this project. The CD/DVD option sounds much more practical and logical than a bunch of single printed documents. Please let me know in what format I must pay for this collection. I received no response OVER 6 MONTHS LATER. Hello, I have waited over 6 months for a response from you. I told you that the CD/DVD format sounded favorable. That is to say: I'd like it. I want to pay for it. Please prepare the formal response and quote. This is my second response to your informal response. Once again, what monetary format do I use to pay for this collection, and how do I make the payment? NARA, please let your absurdity end! The world deserves to see at least those FOIA documents which you have offered to me! It's interesting also the fact that, according to the FBI, in October 2010 there was a "pending or prospective law enforcement proceeding relevant to these responsive records". So, officially, the PENTTBOM investigation was an open investigation two years ago, in spite of the "Zacarias Moussaoui trial" that ended in 2006. Or maybe the FBI was planning (and is planning yet) another investigation about 9/11. (1) The number of passengers; (2) The total weight of the loaded airplane; (3) The maximum allowable takeoff and landing weights for that flight; (4) The center of gravity limits; (5) The center of gravity of the loaded airplane, except that the actual center of gravity need not be computed if the airplane is loaded according to a loading schedule or other approved method that ensures that the center of gravity of the loaded airplane is within approved limits. In those cases, an entry shall be made on the manifest indicating that the center of gravity is within limits according to a loading schedule or other approved method: (6) The registration number of the airplane; (7) The origin and destination ; and (8) Names of passengers. (b) The pilot in command of an airplane for which a load manifest must be prepared shall carry a copy of the completed load manifest in the airplane to its destination. The certificate holder shall keep copies of completed load manifests for at least 30 days at its principal operations base, or at another location used by it and approved by the Administrator. Well, the officials I spoke with said it was unusual for them to expire before several months, rather than a single month - and the records can be destroyed after, say, 6 months. They also claimed it was "highly irregular", "unusual" and "confusing" that they weren't collected in a very obvious place on the very day of September 11th, 2001 after so-called tragedy struck. In the case of an apparent national emergency, the records could be kept indefinitely. Yet, no such records apparently exist. ... if you could point to a record, please? There's the rub. There are no responsive records at all. 9/11 researcher Elias Davidsson tried to obtain a copy of the load manifests asking directly to the airlines and didn't receive any authenticated document, only a list of names of the alleged passengers. So there can't be a pending or prospective law enforcement proceeding relevant to these load manifests. Because the load manifests don't exist. Perhaps no load manifest forms exist. It appears they do not. But if they wanted us to believe there were airplanes, something like it would have to be provided. I am asking for material pertaining to my request for load manifest information and since something has been collected and it fulfills my search request, why does NARA appear so hesitant to complete this transaction? I am giving them their $15 aren't I? If Elias Davidsson failed in some other mission, it's not important to this separate FOIA request, as I've already demonstrated. If everyone filed for some information, as I've suggested before, it could show the true public demand that there is. Elias and myself - that makes two people to file for load manifest form information using different strategies? Did Elias ever challenge the decision given, as it was outlined in the letter as an option to do? I am not saying the FOIA information will be useful; for my part, I plan on seeing what NARA will say next to my request for them to fulfill their jobs and provide me with the FOIA files requested and - at least so far - permitted compilation and delivery to me as an American citizen. Call me a time-waster if you wish. Is anyone else pursuing this line of inquiry at this time? Update: I have received a response to my e-mail sent today, and I will follow up this post with a further response when I know more. hoi.polloi wrote: If Elias Davidsson failed in some other mission, it's not important to this separate FOIA request, as I've already demonstrated. If everyone filed for some information, as I've suggested before, it could show the true public demand that there is. Elias and myself - that makes two people to file for load manifest form information using different strategies? Did Elias ever challenge the decision given, as it was outlined in the letter as an option to do? According to Davidsson, that's the exchange of letters in 2005 between him and American Airlines. Firstly, he was not asking for the load manifest, but for information about the last people who attended the boarding and departure of AA77 alleged passengers. Ms. Klaus contacted me in relation to your request, which I misunderstood as a request for the passenger list of American Airlines' flight 77 on 9/11/01. That information is a matter of public record and I had hoped to assist your search by providing it. Then Davidsson asked for an authenticated document and only received a list of names (not including the names of the alleged hijackers). I am not concerned about formatting. The email you sent contained correct adequate formatting. What I am asking is for a replica of the original passenger list (either a scan of the original, or at least a document faithfully reflecting the contents of that list). Why can't you send me a facsimile copy of the passenger lists, including the names of the terrorists? This is the information we have for public release. I am glad to have been of some help to you; best wishes on the remainder of your project. The official story from American Airlines, FAA and everyone else is that NARA is the official repository of "all 9/11 information". As long as some official channels are available to me, I cannot lose all my faith completely in the legal system. Why give up so easily? There are some people in government trying to do their job well. None of us can help it if those people are only allowed to show gestures of appreciation for our diligence, as the real information is not available to them to give us. What we can get should be pursued for the sake of what we cannot. I cannot say it's anyone's duty. After all, we have every right to cease the pursuit and throw up our arms. We have all done so in so many areas of our lives. By a stroke of luck, the CD/DVD promised is apparently on its way. What comes of it is anyone's guess. hoi.polloi wrote: By a stroke of luck, the CD/DVD promised is apparently on its way. What comes of it is anyone's guess. Me too! I was almost going to order a copy myself! Well, uh, looks like more clowning around and delays by FOIA, unless something got lost in the mail again. Thank you for your message. I mailed a letter to you with a price quote on May 9, but it appears that you never received it. Attached is the price quote in PDF format for the selected Federal Aviation Administration (FAA) 9/11 files in which you are interested. The files will fit on one CD/DVD. The cost of the CD/DVD is $15. To order the files, you may pay with a check or money order (payable to "National Archives Trust Fund") or by using an American Express, MasterCard, VISA or Discover credit card. Please return one copy of the attached order form (either with your check or annotated with type of credit card, account number, expiration date, and your signature) to the following address: Trust Fund Cashier; National Archives at College Park; Suite 5100; 8601 Adelphi Road; College Park, MD 20740-6001. Please do not send any remittance to this office. You may also fax the order form with your credit card information included in the appropriate section to 202-357-5906 or call the Accounts Receivable Specialist at 301-837-3720 with your credit card information. If you have any questions, please feel free to contact me by email at marykay.schmidt@nara.gov or by telephone at 301-837-0596. After the Trust Fund notifies me that they have received your payment, I will prepare the CD/DVD and notify you when it is ready for shipment. Is the following address still correct? Thank you for your timely response. I am curious because I never received such a letter, though the address you have on record is still correct and has been since my order. Did you send multiple letters, or just one? Can you please tell me why I wasn't informed that the letter was sent, and why I received inadequate follow-up communications when I apparently failed to respond to your letter that was apparently misplaced? In any case, thank you for your recent response and a letter with enclosed payment will be on its way to the Maryland address you provided as soon as possible. Thank you for verifying that I have the correct address. I mailed a single formal response, along with a price quote, to you in May. I regret that you did not receive it. It is not unusual for us to send out price quotes and receive no further response from requesters. I will fulfill your request as soon as possible and keep you informed. There is just one problem I noticed with this form. It says it expired in May. Is it possible for me to have a form relevant to now - this time period - just to assure that there will not be further delays after I send payment? I do not want to ruin an opportunity to get this transaction made. Thanks for bringing the expired form to my attention. To simplify things, I will just duplicate the files and send the CD/DVD to you for free. I'll let you know when I'm ready to mail the package. Thanks for your patience. I very much appreciate it, but I insist on paying if it's possible. I will send my payment with the present form, as it is, and if the money is used or not can be up to NARA. Thank you for your offer, but please don't send any payment. Let's just start fresh with any future transactions. You surely are an exemplar. Can you please confirm that you have mailed out this CD/DVD? It has been a month now, and I have received no word from you. Hello. This is ____________ again. Can I please insist that I pay for this NARA FOIA request again, so that I can be more certain that all the wheels have been oiled and I can get this DVD/CD (over two years coming) finally mailed out to me? If this is too difficult to accomplish because you are busy, would you mind please getting someone to do it who can get it done more quickly? It doesn't have to be polite or nice, as long as I can please just get it mailed out. I have sent the payment in the mail. I hope you do not take offense, but just in case the lack of payment does end up being something that held you up, it is now on its way. I hope that there are no further delays in our transaction but if, for whatever reason, you believe you need something else, please let me know AS SOON AS POSSIBLE! Please let me know when the payment is received. I expect it should be there in little more than a week or two. I've only had to exchange one or two more reminder e-mails with them, and they say the files are on their way! Will they ever reach me? Only Lockheed Martin, our mail sorting contractor for the U.S. Government, apparently knows. Well, it's finally arrived: NARA's response to my attempt to locate the 9/11 flight envelopes that apparently don't exist. Nothing within these files indicates any further evidence that a Flight Manifest for any of the allegedly existent aircraft was ever a real thing. The only thing that suggests the existence of a Flight Manifest is the sheer lack of them in the face of the other evidence for the airplanes. But what other evidence is there? Unfortunately, the evidence of human disappearances associated with the airplane disasters is scant and filled with forensic problems. Besides not being able to nail a final passenger list that can be confirmed by any organization, the strange faces and articles about the victims and their associated family members are highly suspect under forensic scrutiny. Visual evidence for the airplanes is tarnished by the fact that it is computer-generated false imagery. And the physical evidence is apparently non-existent. Much of further record-keeping of these airplanes being flawed, I could only conclude these recordings presented in the FOIA response are part of the military drill simulation occurring during September 11th, 2001, if I were being generous. Or else, they might have been created before the terrorist drill or in the 12-year interim since, but alas we can never know, and I am not convinced that further FOIA requests would net me much more useful information. I would encourage everyone to try and see what else we can get, especially if someone has a hunch based on this content. I am ready to conclude I am well in over my head, as far as understanding these files, but they appear to be useless. Based on the index given to me many many months ago (which I had to more-or-less blindly select from based on file title alone) I did my best to request files that looked pertinent to the search for lists and interviews (as such terms seemed to be the primary citations for passenger lists in the Commission Report) but it seems I failed to hit a vein of anything plausible. Instead, the titles I requested mostly appear to be minor requests and memos and note-pad transcriptions for lists and interviews not available at NARA or anywhere. A Kafka-esque comedy of onion layers. Where are any of the results of these notes and memos I've received in this FOIA response? Potentially, presumably, locked up forever in FBI or CIA case files should they even be real evidence of a real core to the layers. It seems increasingly possible all there is is a kind of skin of paperwork with no true structure beneath it. Please bear in mind both the length of time since September 11th and the 3-year span since my initial request began processing somewhere in NARA's cogs. We have no idea when any of these documents were created, nor the length their creators might go to present the appearance of a thorough and functioning bureaucracy. Hence, I think it's safe to take all of it with a hefty bag of salt. Just don't clog your arteries if something within hits a false note with you. There is a list of investigation items that I would sincerely love to have in my possession to share with the public, and for which there mostly seems to be no available evidence for. e.g. ; official passenger manifests, official crew list details, recorded land line calls from airplanes, drawings/schematics of wreckage distribution, etc., etc. among a number of other requests that a real investigation should have warranted. On number 12, the requested evidences for the hijackers, it is highly interesting to note just how little of this evidence seems to even be in the dialogue of possibilities, let alone existent. This document kind of opened my eyes to the incredible flimsiness of the official record for the official story. It's right; this should be the bare minimum of documentation - much of it public - for such an event if it were remotely real and historic fact. The dearth speaks volumes more than a hundred FOIA requests for the same. "If it's sold to us you're going to see more programs. You're going to see more grassroots programs where we're going to start looking to get the kids when they're 6, 7, even maybe younger than that onto the ice," said Pat Delorenzo, Sportsplex of America. 1. The documents are modern creations that have nothing to do with September 11? 2. Searches into the nature of these documents is "skating on thin ice"? Or perhaps I am just being imaginative and I've missed a different Pat Delorenzo much more relevant - the average news is sprinkled with ridiculous symbols enough as it is - but then it's a fascinating diversion. At the rate and with the methods they are using to craft artificial evidence for new events, it is not a stretch of the imagination to picture them doing this for FOIA requests. But let's assume the benefit of the doubt for the sheer fact that this FOIA response doesn't seem to say much for or against the official story anyway. At least nothing we can decipher. If anyone finds I am wrong and there is something worthy of the public's interest in this FOIA response, please post anything interesting from the collection in this thread. Or heck - start your own FOIA request! "I love you my brother, I will come and help you! Come out and help me my brother!" says an Arabian-sounding voice in English. Uhh, what? Was this made by the South Park boys? And what's with the noises at the beginning and end? Perhaps they are conventional for some standard (NORAD? ), but I couldn't help thinking this was a sound that indicated: "You are now entering the simulation". This is the shortest of the audio files and I have yet to explore the others.